Awesome Friday! » Blog Archive The Legend of Korra: Episode 2.07 & 2.08 Recap, Thoughts & Speculation - Awesome Friday! Studio Mir returned this week for a special 2-part episode of The Legend of Korra, and what a treat! The animation was gorgeous, the style was beautiful, and the story itself was fun and engaging. If you only watch two episodes this season, make it these two. My recap, thoughts and speculation are below the jump. When we ended episode 2.06, Korra had lost her memory. 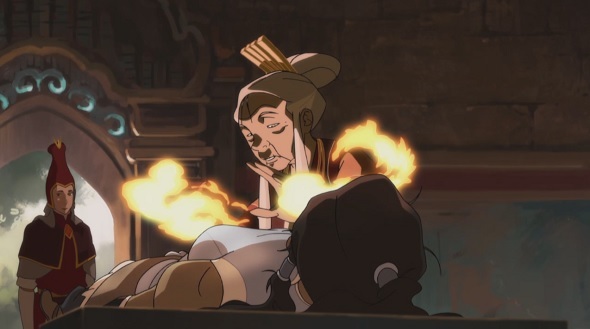 As this episode opens, the Fire Sages bring Korra into a temple; she’s barely conscious, murmuring “Raava” over and over. The Fire Sage shaman uses firebending to determine that a dark energy has infected Korra. 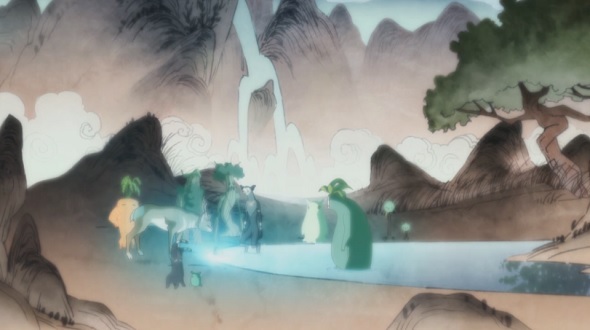 She and the other Sages immerse the Avatar in a special pool that will help cleanse the darkness from Korra’s spirit. Korra opens her eyes in another realm and faces an apparition of herself. 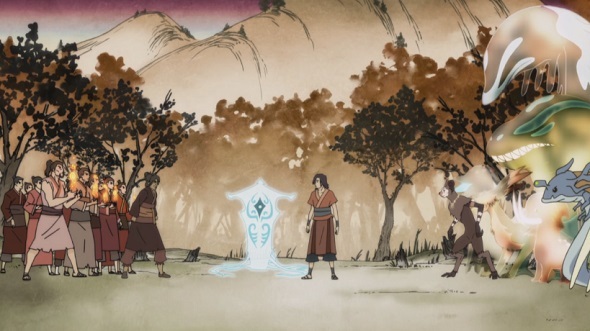 The apparition switches between four of her past selves (Avatars Aang, Roku, Kyoshi and Kuruk) and informs her that she has lost her connection with her Avatar spirit. Once she has restored that connection, she will regain her memory. She must find Raava. Another Avatar appears, saying he can help her. His name is Wan; he is the first Avatar. We enter a flashback of Wan’s beginnings, in a world that’s stylized similar to an ancient scroll, or to the videogame Okami. In this age, spirits roamed the world, and humans lived safely in cities on the backs of giant lion turtles. Whenever humans needed to venture into the wilds, the lion turtle would temporarily grant them the power of bending to defend themselves against spirits. In an Aladdin-like sequence, Wan steals bread from the rich Chu family and runs from their guards. After a successful escape, he splits the bread with an elderly half-tree-man named Yao (it’s later revealed that spirits are responsible for his tree-like appearance) and a boy named Jaya. Wan gives his own share to a group of hungry wildlife. In desperate need of food or money, he volunteers to join a group of villagers who are heading into the wilds to hunt. The lion turtle grants the group the power of firebending until the end of their mission. Once they’re in the woods, Wan fakes being terrified so that he can return home. Instead of returning the firebending to the lion turtle, he keeps it for himself. Back in the city, he organizes a strike force to attack the Chu family and steal food for the hungry villagers, using his firebending to defend his party. The plan goes awry; the Chu family captures Wan and brings him before the lion turtle. Wan is banished to the wilds, but allowed to keep his bending to defend himself. His first night is so harrowing that the next morning, he approaches a spirit oasis, desperate for refuge. The spirit in charge of the oasis, a large lemur-like being named Aye-Aye, turns him away, even when Wan tries to disguise himself as a bush spirit to sneak past. Wan returns to the wilds, and spots a cat deer trapped in a net. Starving, he approaches it to eat it, but when he sees how frightened it is, he tries to rescue it instead. The hunting group from the village appears, however, and tries to stop him, saying the animal is their dinner. Wan leads them away from the animal, intentionally exposing his pursuers to some of the wilds’ environmental hazards. Aye-Aye, admiring the boy’s brave attempt to save an animal, pitches in, possessing one of the humans and leaving him permanently disfigured. Aye-Aye brings Wan back to the oasis, exposing him to the oasis’ healing waters to heal his wounds from the chase. The cat deer, Mula, becomes Wan’s animal companion. Newly recovered, Wan decides to stay at the oasis and learn the way of the spirits. (Aye-Aye considers him a pet, nicknaming him “Stinky.”) During his time with the spirits, Wan trains with a dragon, who teaches him to master firebending (a nod to the mythology we were shown in Avatar: The Last Airbender, when Aang and Zuko dance with the dragons.) In any subsequent attacks, Wan defends the oasis from humans. Inspired by his mastery, the downtrodden humans in the city ask the lion turtle for the power of firebending and venture into the wilds to start a civilization of their own. Eventually, Wan decides he needs to see more of the world and seek other lion turtle cities. After travelling for some time, he comes across two giant spirits, one dark and one light, entangled in a violent fight. The light one is dominating, and the dark one makes a convincing appeal to Wan to help free him. With Wan’s assistance, the dark spirit escapes. The light spirit is furious. She says she is Raava, the force of light and peace; Vaatu, the dark spirit, is the force of darkness and chaos. They have battled over the fate of the world since the dawn of time, and she has kept Vaatu in check — until now. Wan has released chaos into the world. Upset about what he has done, Wan offers to help Raava fight Vaatu, but she refuses. He continues on his journey instead, and chances upon some airbenders — his first glimpse of humans from another hometown. He follows them and finds another lion turtle floating in the air. 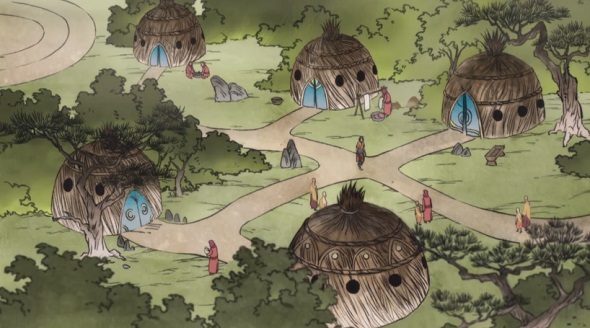 Using a tree to slingshot himself across, Wan finds a small city of dome huts. At first, it seems like a peaceful cohabitation between spirits and humans, but the spirits suddenly begin to turn vicious: Vaatu is passing by, unleashing the chaos within the spirits. Wan fights against the dark spirits, defending the airbenders. Raava, still pursuing Vaatu, appears, looking decidedly smaller; “as darkness grows, light fades.” The more spirits Vaatu converts to darkness, the stronger he becomes. Wan is determined to set things right. He vows to work together with Raava to stop Vaatu, and this time, she reluctantly accepts. He approaches the lion turtle so that he can be granted the power of air to help with his quest. Raava will act as the keeper of his airbending powers, as no human has ever wielded more than one element at a time. Soon, Wan finds out the stakes are even higher than he thought. Every 10,000 years, the Harmonic Convergence (a planetary alignment and a merging of the North and South spirit portals) locks in a new reign until the next convergence: either light or darkness will prevail. Until now, Raava has always prevailed. If Vaatu defeats her at the Convergence, then darkness will reign for ten thousand years. They only have a year to prepare. Together, they train, visiting more lion turtles so that Wan also gains the powers of waterbending and earthbending. During Wan’s training, they come across a human settlement that includes Wan’s old friend Jaya. Time living in the wilds has hardened Jaya’s views of the spirits, and his people thoughtlessly destroy the wilds and fight spirits for their own gain. A fight erupts between Jaya’s people and Wan’s old spirit friends from the oasis. Wan tries to intervene, but Vaatu passes overhead, and the spirits lose control. To give Wan more power to keep the two opposing sides at bay, Raava temporarily possesses Wan, but if she stays in his body too long, she will kill him. He begs her to keep possessing him so they can hold back the fighting, but he collapses. Raava carries him to safety as the two sides clash. When Wan awakens, Vaatu informs him that the humans have already been annihilated. Raava is so tiny and weak now that Wan puts her in a tea kettle to keep her safe. The Convergence at hand, Wan and Raava head toward the spirit portal for their final showdown with Vaatu. They cross through to the other side, to the meeting of the two worlds. The Southern spirit portal glows blue, and, not too far away, Wan can see the red Northern portal. Vaatu appears, and the showdown begins. Alone, Wan is no match for Vaatu. Raava possesses Wan to make him more powerful, and things look better for awhile, but as the Convergence begins, Vaatu appears to be the victor. Impulsively, Wan touches the light beam of the Convergence; he bonds permanently with Raava. Their bond is so strong that he’s able to take down Vaatu, solidifying the reign of Raava for another ten thousand years. He imprisons Vaatu behind a magical barrier, then closes the spirit portals so that no human can enter the spirit world and release him. The two realms are separated as a result. Wan will act as the bridge between the two worlds. The flashback jumps to a shot of Wan in armour, dying on a battlefield. He laments that there wasn’t enough time to bring peace to the world. Raava says she will be with him forever, in all of his lifetimes, and they will never stop pushing for peace. Thus, the Avatar reincarnates for the first time. 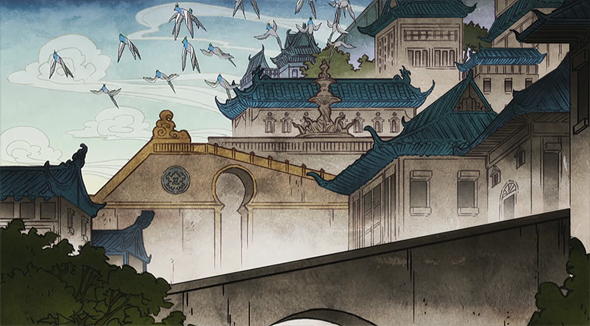 Back at the temple, Korra awakens, fully in possession of her memories again. The Fire Sage shaman presents her with an air bison, warning her that the Harmonic Convergence is only weeks away. Korra is determined to close the spirit portal before that happens so that Vaatu cannot reign. The animation, the art style, the story arc, the music — everything was brilliant. I loved how this story tied together the little snippets of mythology we have been seeing in both Avatar and Korra. There were a couple of spots where I felt the pacing was a bit off or a line of dialogue was a bit awkward, but that is such a tiny, tiny critique in the face of so much awesomeness. These two episodes are my favourite not only in The Legend of Korra, but possibly in the entire Avatar franchise. The animation, in particular, was head and shoulders above the animation we’ve been seeing so far. Studio Mir’s gorgeous work has been missed so far this season, and their return was welcome. There are rumours going around that they also animated episodes 10-14 of this season, but I won’t get my hopes up just in case. Studio Pierrot is decent, but it can’t hold a candle to what we’ve seen from Studio Mir. Kudos to the team for a job well done. This is the calibre of story we have been waiting for ever since Korra was first announced. One thing I had been missing from this season so far is engagement; the mysterious plot hooks were part of what was so engaging about Book One. While it took a little while to get here, I’m glad things are finally rolling with this season. The theories are flowing. Needless to say, my theories are all over the place. 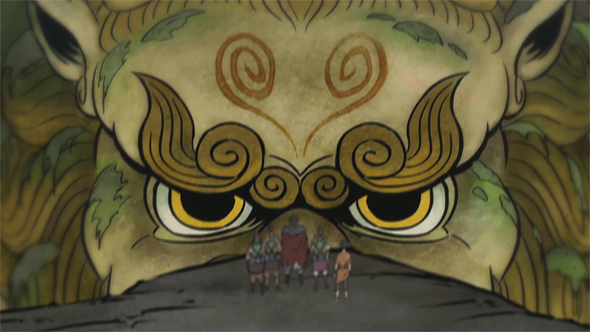 Unalaq wants Korra to destroy Vaatu. 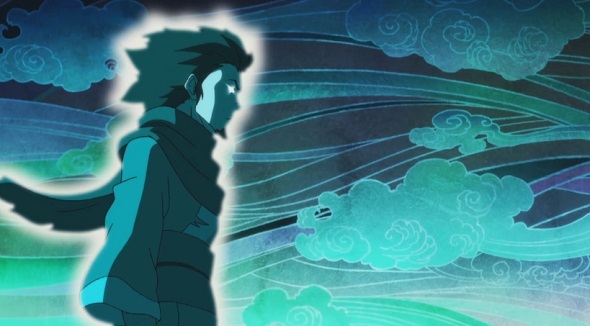 His comments about wanting to help Korra meet her destiny could suggest he wants her to destroy all darkness from the world; he may not realize that Vaatu would emerge from Raava if this happened. In this case, he might want to release Vaatu so that Korra can kill him. This is the “Unalaq is not actually a bad guy” theory. 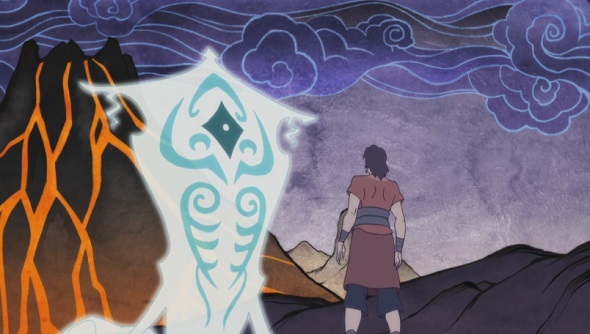 Crack theory: Unalaq killed Vaatu, and now Vaatu is emerging in Korra. Raava says that even if Vaatu is destroyed, darkness will form in her until Vaatu emerges again. The Fire Sage shaman said there is darkness within Korra. Unalaq has been in the spirit world, and seems desperate to have Korra there for the Harmonic Convergence. 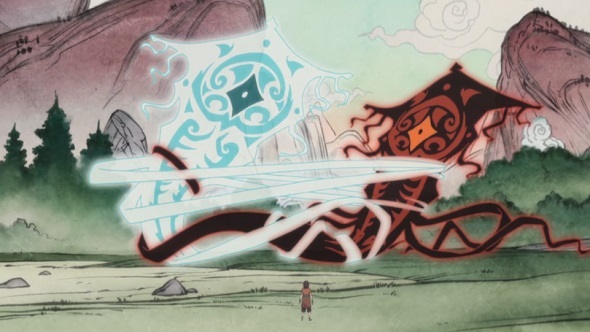 What if Unalaq took it upon himself to kill/destroy Vaatu, and wishes to lock in Korra/Raava as the ruler for the next 10,000 years, but darkness has begun to emerge in Korra/Raava instead? The darkness in the world, even when the portals to/from the spirit world were blocked, suggests that the Vaatu-like force already exists within the corporeal world. I’ll admit this theory is a huge stretch, but it’s my favourite, because it means Unalaq’s “evil” nature comes from trying to do the right thing, and means Korra will have to learn to balance her own light and darkness. It would also explain her unreasonably angry behaviour this season. I wouldn’t put money on this happening, though — let’s just consider this one a crack theory. It will also be interesting to see how/if Varrick fits into all of this. Is he just profiteering? Is there more to him than we have seen? I’m excited to find out. My only complaint is that Team Avatar is secondary to all of this (except, arguably, Korra), and I’m really hoping they tie back into the main plotline, instead of just being there while another story plays out. Two weeks to wait until the next episode! Have speculation of your own? Want to discuss any of these theories? Feel free to comment below!